Yesterday (Friday) was my birthday; I’m 38 now, I guess beyond doubt putting me in my late thirties. Twenty years have passed since I became a legal adult; I’ve known my wife for almost twenty years; Kurt Cobain has been dead for more than twenty years; Soundgarden has been broken up long enough to get back together and to remaster old albums. Hammerbox remains broken up after a failed revival, which, alas, is probably for the best (although their in-studio acoustic performance was pretty awesome). It’s been 20 years since George Lucas made it clear that he really did intend to make the Star Wars prequels, and now next year we’re going to get Episode VII. Tim Burton’s first Batman movie is 25 years old, old enough for Michael Keaton to make a movie that effectively functions as metacommentary on his time in the role. And, now, Twin Peaks has been over long enough to get a third season continuation. Y’all have no idea how big of a deal this is to me. A Cocteau Twins revival would be just about the only thing that could possibly make me giddier at this point, but I’d be wary of that after how Hammerbox’s reunion was apparently over before it began. Flesh of My Flesh threw me a lovely dinner party with several of our new friends here at Holy Cross, and instead of making me a birthday cake, she made me a cherry pie (using the Access Guide recipe) as a way of celebrating the news; our crowd last night was mostly too young to have seen Twin Peaks, however, so this required some explanation. Explanation led to watching the pilot episode with some of our guests; I expect this will lead to watching future episodes with some of them. Much pixelage has already been employed in speculating about what the 2016 season might look like, so I don’t want to repeat any of that. The series finale and Fire Walk With Me both suggested that there was still a lot of story that Lynch had to tell, so I’m not particularly concerned about that (particularly with Laura Palmer’s line to Cooper about seeing him again in 25 years). What I am wondering about, however — and not from a standpoint of concern; I want my Twin Peaks revival and I want it now; bring me a TARDIS so I can go to 2016 immediately and watch this — is this: Twin Peaks, when it came out in 1990, had a context of a particular widely-held image of the Pacific Northwest. Money Magazine had declared Seattle the best place to live in the United States in August 1989, to be sure, but keep in mind that this was pre-“Smells Like Teen Spirit” (Melody Maker had only just run their first major article on the “Seattle sound” in March 1989), and Microsoft had only just made their initial public offering in 1986, not to mention that Windows was only on version 2.x, so the tech industry had yet to permeate the Northwest landscape the way that it would by the late 1990s. Really, the main things that the Pacific Northwest was known for when Twin Peaks debuted were serial killers, UFO sightings, Boeing, mountains, and logging; Twin Peaks needed all of that to work, and it played with each of those elements on some level. So, twenty-five years later, when Pearl Jam is now what Aerosmith was when Twin Peaks came out and Kurt Cobain is the Northwest’s iconic rock death (surpassing even Jimi Hendrix, maybe), when the image of the Pacific Northwest is now split between Seattle as the techie haven for the nouveau riche and Portland as the hipster capital of the world, when the Seattle Mariners are tied for the most wins during a season, the Seahawks have won a Superbowl, and basketball has left Seattle in favor of soccer, what will the town of Twin Peaks look like 25 years later? 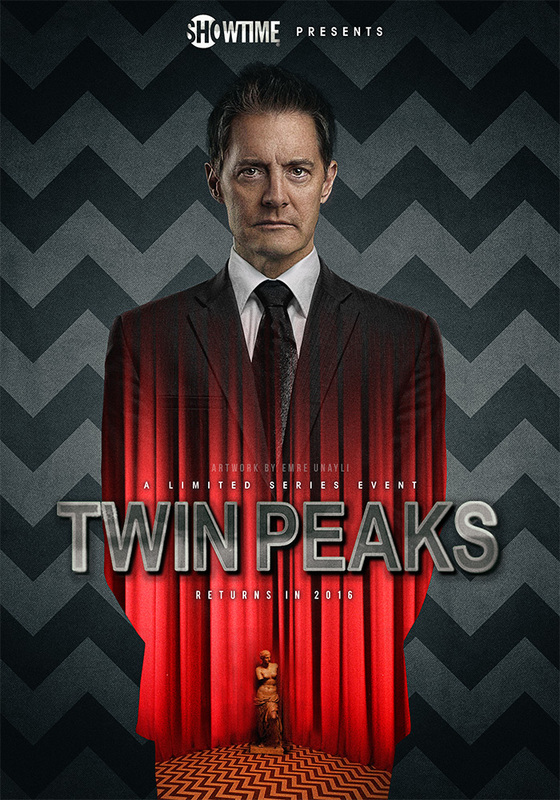 Now, the show was specific about locating the town in the northeast corner of Washington state, which is still basically the middle of nowhere, but if the Twin Peaks of the revival still looks exactly the same as the Twin Peaks of 1990-1992, well, it would be tempting to say that it’s David Lynch’s riff on Brigadoon. One wonders if technology might be kept self-consciously retro — will Cooper still be dictating notes to Diane via microcassette recorder even while the rest of the world has moved on to smartphones? Will we know that he’s still possessed by BOB because he drinks K-Cup coffee? And, of course, there’s the question of how a new Twin Peaks season can break new ground after twenty-five years’ worth of television that has been influence by Twin Peaks. X-Files, Northern Exposure, even Veronica Mars — heck, for that matter, Hannibal the last couple of years, in which Mads Mikkelsen has given us a Hannibal Lecter with Ray Wise and Frank Silva as reference points every bit as much as, if not moreso than, Anthony Hopkins. What can Lynch bring to the form now, a quarter-century later? Speaking of Ray Wise, since Fire Walk With Me he’s been a bad guy in 24 and, quite literally, the Devil in Reaper. Frank Silva passed away in 1995, so presumably Leland will now be BOB’s permanent form. The way they could get around this would be to cast Silva lookalike and opera star Greer Grimsley, but I’m not holding my breath on that. I will say that the perspective I have now of Twin Peaks at 38 is wildly different than that which I had even twelve years ago. Watching the pilot last night, things that used to seem self-consciously melodramatic now seem quite real. Where I once might have wanted to chuckle at how deliberately over-the-top Lynch was being — for example, his cutting back and forth between a hysterical and screaming Sarah Palmer on one end of the phone line and a Leland Palmer who, presumably, is coming to the dawning realization that his daughter has been murdered and reaching hysterics himself (but is he? Even after Fire Walk With Me, this is still ambiguous) — now I look at it and think, “Yeah, that’s about what it would be like if I got the news that my child had been killed; Lynch just isn’t letting the camera move away, no matter how much I might want him to.” Broadchurch (and Gracepoint, to the extent that it’s a scene-for-scene remake) also manages to capture this rawness of parental grief, but in a much different way; it’s a far more self-consciously realistic treatment of a similar moment. One final thought for now — Twin Peaks was a cultural moment, not unlike the ’89 Tim Burton Batman (yes, I know, that’s a touchstone that makes a particular kind of sense to me and perhaps nobody else), that was about the end of the 1980s marking some kind of a generational shift. Batman looked at this from the urban angle; Twin Peaks looked at this from the small town angle. Batman played with deliberate anachronism, putting Prince songs in the same world as 1920s-era gangsters, creating a Gotham City you couldn’t really locate on either a calendar or a map but that was still identifiable as a caricature of a New York that had produced Michael Milken, Ed Koch, John Gotti, and Bernie Goetz. Twin Peaks didn’t go the route of anachronism; rather, it gave the audience a world that was very specifically dated (24 February 1989 is the date given in the pilot episode, meaning it took place exactly 12 years before my wedding day) but that also freely employed the ethos of an earlier generation, while implying very strongly that that there was something seriously rotten underneath that generation’s surface. Certainly the presence of flannel, jeans, saddle shoes, and a sheriff named Harry S. Truman made Twin Peaks feel like a town that had been spared the nastiness of the ’80s; then there was the cast. All the young, scrubbed, shiny faces of James Marshall, Lara Flynn Boyle, Sherilyn Fenn, Sheryl Lee, Madchen Amick, and Dana Ashbrook made the town look like a place where young people might be bored but safe (which made it all the more shocking when their faces might be smeared, sometimes with running mascara, sometimes with blood, sometimes both); Kyle MacLachlan’s lantern jaw, black suit, and slicked-back hair was clearly intended to evoke somebody like Efrem Zimbalist, Jr.’s character from The F. B. I.; amongst the older adults, there was Russ Tamblyn, Richard Beymer, Peggy Lipton, Ray Wise, Piper Laurie — heck, even Michael Ontkean — all recognizable faces from the ’60s and ’70s, all of them now able to put on a sheen of middle-aged respectability, and the show subverted and undermined their respectability from the first scenes of the pilot episode. A generation that had grown up in the ’50s, become adults in the ’60s, and had kids in the ’70s were now having to face the consequences of their choices, Lynch seemed to be saying, and their children weren’t necessarily turning out any better just because they had fled the city for small-town life. This wasn’t Family Ties. Maybe small-town life just made it easier to hide weirdness, ugliness, and evil in plain sight. Thing is, all of those concerns are basically old hat at this point. Many of us assume these days that the cities are corrupt hellholes and that there is no Mayberry, that small towns are probably cesspools of backwardness, ignorance, and abuse that cover it up with a sheen of self-righteousness that refuses self-reflection. We know that there are no safe havens anymore; New York isn’t really the land of opportunity and the small town in the middle of nowhere isn’t a sanctuary against the evil that men do. And, unfortunately, it’s no longer the bloodcurdling shock that it once was when we find out that Daddy was doing bad things to his kids, and we don’t need the distance of demonic possession to make it believable. We accept it, we process it as just one more tragedy, and we know that the generation that’s growing up right now is basically screwed no matter where we live or what we do. We’re over it; life goes on somehow. Next topic. So, the point of this is to say — how will a new Twin Peaks season engage our current cultural anxieties the same way the original did, using the original’s setting? I assume Lynch and Frost must have something in mind for how they might do this, but how? In the real Pacific Northwest, the Ghostwood Country Club and Estates were eventually built everywhere, replacing the woods. Does that mean that the evil lurking in the woods has been let out into the open? Or has it just been built over for now, and it’s biding its time? I guess we’ll find out in 2016.